The worst thing about living in Chicago, which is otherwise pretty great, is that to get yourself to any sort of natural environment you have to go far. (There are of course many city parks, the lakefront, the forest preserves, the botanic garden, etc., all of which add immeasurably to one’s quality of life around here. But it’s not the same as being away from it all. Nor are the Indiana Dunes, with their nuclear-power-plant views. And, let’s face it, farmland is as “unnatural” an environment as a city.) Most Chicagoans go to Starved Rock State Park, about 1.6 hours away in Utica, Illinois. And indeed, Starved Rock is a nice place to be. But it’s too bad that people skip over Matthiessen State Park, just a couple of miles past the entrance to Starved Rock. For one thing, there are often fewer people at Matthiessen. At the Dells Area, there are waterfalls and you can go walking around in the river: it’s arguably more pleasant than the sandstone bowls at Starved Rock. 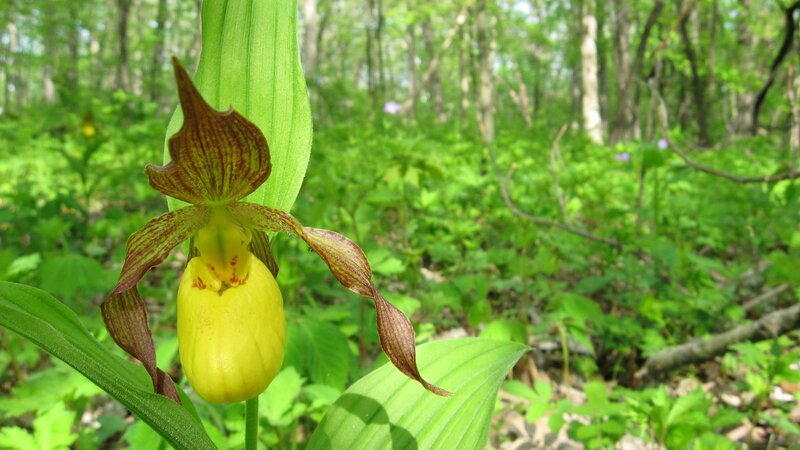 We recently went to the River Area for the first time, and found wild orchids. I am always amazed at the corners of beauty that can be found, even in areas I think I’ve explored before. Glad you found this treasure. Yep, wildflowers are great that way: something new every couple of weeks.